There are situations where a student creates their own student blog or you need to add an existing student blog to My Class. This is easily done using Join a Class! This page contains instructions your students need to follow to connect their student blogs to the class blog. You must set up My Class on your class blog by referring to the My Class support documentation page before sharing instructions on this page with your students. Click on the Print icon at the top of this support page to create a Handout. You can delete any unnecessary text by hovering over the text and then click on “Click to Delete”. We recommend you replace the name of our class blog in the Join a Class instructions with the name of your class blog. Once your teacher approves your request to join the class you will be added as user to the class blog and your student blog. This means you will have access to both the class blog and your student blog dashboard. You will see less menu items if you are logged into the class blog dashboard. To publish posts you need to be in the dashboard of your student blog. The easiest way for you to read posts on your friend’s blog is to add the class blog widget to your sidebar. 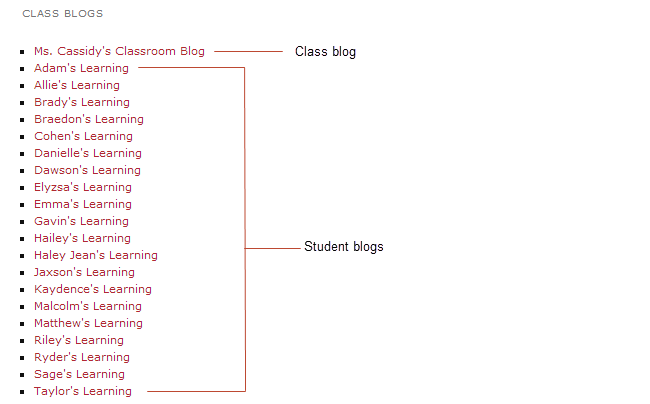 The class blog widget provides a handy link to all student blogs attached to Class Blog. You just need to click on the link to easily go to a class mates blog. Any time more student blogs are added to the Class blog you update the Class blog list by opening up the Class blog widget and clicking Save.